The Gold Cross Range consists of 30 vibrant colours in the HIGH TEMP range and 29 colours in the LOW TEMP range, which never go out of fashion. Additional shades can always be produced, by blending two or more colours. The diagram (right) indicates the general principles of colour blending. Red is a mixture of Violet and Orange. Green is a mixture of Yellow and Blue. Blue is a mixture of Green and Violet. Orange is a mixture of Red and Yellow. Grey is a mixture of Red and Green. Brown is a mixture of Blue and Orange. Therefore, if you dye Navy on top of Red, the Navy may show a Violet tint. From the above table you can see that Navy Blue is a mixture of Violet and Green. As the Violet tint evidently predominates in this particular case, balance the shades by adding a touch of Green. Similar principles apply to the blending of other shades. Colours illustrated are obtained on white. 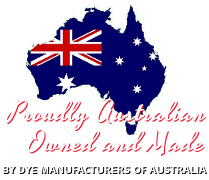 Original colour of the fabric – When dyeing coloured fabrics, remember that a blend of the original colour of the fabric and the colour of the dye will result: e.g., Blue dye over yellow fabric will result in a green tone. Dyeing over patterned fabric will only change the base material colour. The pattern will still remain. GOLD CROSS FABRIC STRIPPER (Colour Remover) can be used to reduce the colour intensity of previously dyed garments and will remove most soil, perspiration and ink stains. Gold Cross Fabric Stripper will not harm even the most delicate fabric which can be boiled in the wash. Type of fabric. Within any fibre group there will be variations in dye absorbtion and therefore slight colour variations. Loosely spun fibre and loosely woven material such as towelling, will absorb more colour than finely woven materials. Dry weight of Fabric – the colour on the lid corresponds approximately to the colour achieved when dyeing 500gr dry weight white cotton with HIGH TEMP dyes, or 250gr dry weight when dyeing with LOW TEMP dyes. NOTE dyeing a larger amount will give a lighter colour. Strength of Dye Solution – Use sufficient water to cover the material and allow movement within the container. Using more water than necessary will dilute the solution to an extent that only light shades will result with reduced colour fastness.